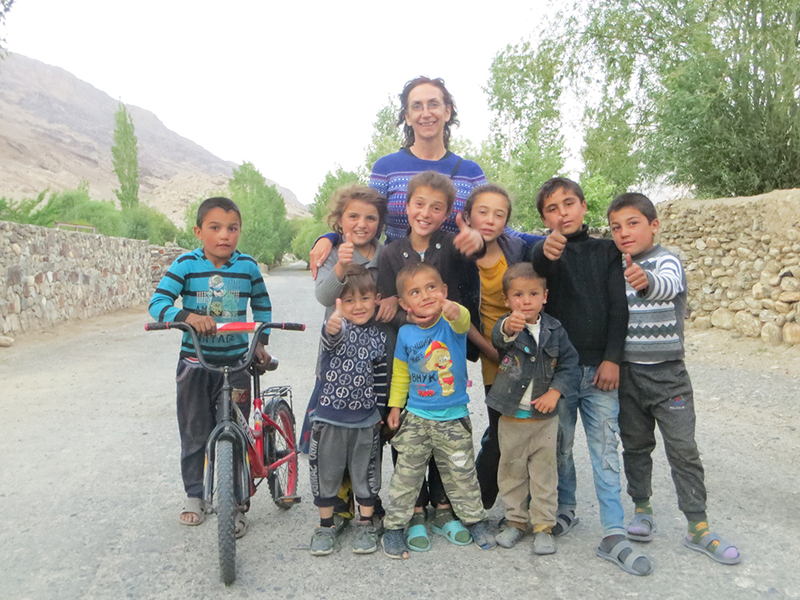 Cathy Raymond, who works in the Office for International Students and Scholars at Washington University, recently completed a six-month project as a Fulbright Scholar in Tajikistan. Here, she shares, in her own words and images, about her experience and how what she learned can influence and guide her work and life at Washington University in St. Louis. You recently returned from Tajikistan. This was not your first time visiting the region. Tell us about your work there. I have been working with projects related to the region since 2003, when I started advising new instructors from Eurasia on course design and teaching methods at Indiana University in Bloomington. Around the same time, I was working as director of language materials development at the Center for Languages of the Central Asian Region at IU, where we developed materials in Pashto, Uyghur, Uzbek and Tajik. Somehow word started to spread on campus that I had some experience with the Central Asian region, and I was invited to work on two exciting projects at IU which focused exclusively on helping Afghan university educators: the first was a four-month-long Fulbright educational exchange between Indiana University and Kabul Education University, where I worked with Afghan educators on teaching strategies and English development, and the second was the USAID-funded Afghan Higher Education Project (HEP), where I worked as an English Program coordinator and visiting faculty. As part of my work on the HEP project, I traveled to Afghanistan to interview and select candidates for master’s degree study at Indiana University in Bloomington. The trip to Afghanistan was incredibly fascinating, and I was fortunate to have the opportunity to witness positive and encouraging aspects of a country which was rarely portrayed favorably in the news reports I had seen in the States. That trip and the subsequent two years of teaching and shepherding those students through their advanced degrees were to become pivotal moments for me; working with the Afghan students was simultaneously the most challenging and the most impactful experience in my career and ignited a passion which would help to shape my overall philosophy of international education. By the time my work on the HEP program finished, I was completely committed to contributing to high-quality educational programming in Afghanistan, and I transitioned into what would become an eight-year period of volunteer work for the Alliance for International Women’s Rights, an organization which offers distance English language courses and professional mentoring to girls and women in Afghanistan and Nepal. During that time, I volunteered first as an English teacher, then coordinator, then program director, and finally, as executive director of the entire organization. I took another trip to the region in 2014 (this time to South Asia), when I was sent to Nepal as an English language specialist to develop and write a handbook to train regional centers around the country. During that trip, I was able to make some amazing connections with fellow educators, and I have recently been working on developing future writing workshops with those colleagues. In 2016, I decided to apply for a Fulbright Scholar award to Tajikistan because of my growing commitment to education in the region, and when I received the award for the spring semester of 2018, I made the difficult decision to step down from my volunteer work at AIWR so I could focus exclusively on working with Tajik educators and students. Talk about the ways you feel your experience made an impact there, and how you can leverage what you learned here at home. I think we never really know what impact we are making in life. I was continually surprised when Tajik students would mention a short passing conversation or a piece of minor feedback that had had a life-changing impact on them. As educators, I think we need to be aware that students often look to us for guidance and instruction even when we aren’t delivering an actual classroom lesson and in ways we might not predict. It’s an important reminder that education goes far beyond the classroom. One thing I do believe: our intention with including a field research experience in a course I co-taught was to open our students’ eyes to their own potential as researchers and writers. We wanted them to recognize that they could develop their own researcher identities, investigate questions relevant to Tajik life and society, and report back to the academic community on their original findings. Some of our students were skeptical at first, but they slowly grew into their new roles as researchers, and, by the time the semester was over, they had increased self-confidence and a fairly clear vision of what they wanted to learn and do next in terms of research and exploration. Our goal with these research projects was to help students discover their own potential and to inspire them to investigate questions they were passionate about. I think we had some real impact there, and I hope to see my students continue their research journeys in the future — perhaps even here at WashU! In terms of leveraging what I learned from my experiences now that I am back in the States, I have so many ideas! I am currently working on a doctorate in education in literacy, culture and language education, and the lessons I learned about international education while I was in Tajikistan are already significantly impacting the choices I am making in terms of my own coursework and research projects. I am currently working on an inquiry project which explores writing as a conduit for identity building, self-expression and empowerment. Data for that project include my students’ reflective writing from the field research course and subsequent post-course interviews. In the spring, I have plans for a larger online creative writing project with women in the Fergana Valley in Uzbekistan. Some of my long-term personal and professional goals are to continue sharing my experiences with people here in the States to help dispel myths and misunderstandings about countries like Afghanistan and the other Central Asian countries. 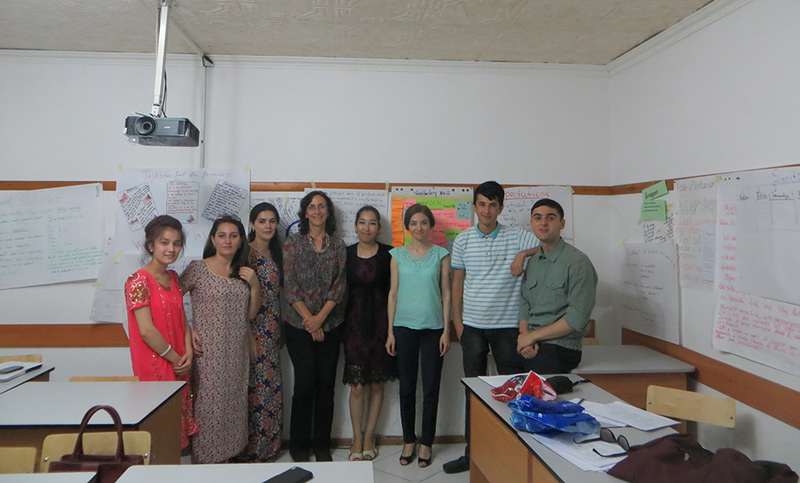 Raymond, pictured here with some of her Tajik students, encouraged them to use research methods to grow as writers. What were you most impressed by during your time in Tajikistan? There was so much that impressed me about Tajikistan: the mountains, the culture, the people! I always worked incredibly hard during the week at the university, but I reserved Sundays to go hiking with the group Hike Tajikistan. We explored so many beautiful places, and it always re-centered me before the next work week. The geography of Tajikistan is about 93 percent mountainous, so there is much to explore! At the end of my half-year stay in Tajikistan, I decided to do a solo trekking tour of the Pamir mountain area in eastern Tajikistan. To start my journey, I took a helicopter to the Pamirs; that alone was the most exhilarating and impressive flight I have ever taken in my life. Because the Pamir Mountains are so high, the helicopter had to weave in and out of mountains. I felt like I could reach out and touch the mountainside. Then I backpacked throughout the region by myself and hiked through the Wakhan Valley area. This area of Tajikistan has a 300-mile porous border with Afghanistan, and I could see the small Afghan villages across the river as I hiked. Each day I would get up early and hike all day and then stay at homestays in the villages at night. In one village, the children took me on a tour of the tiny village and then asked me to play volleyball with them while they taught me phrases in the local Wakhan language. In another village, two farmers called me into the field and asked me to take a picture of their baby. The entire trip was amazing, and I felt surrounded by love even though I was traveling completely alone. I was also impressed and amazed by the rich culture in Tajikistan. I lived close to the city center in Dushanbe, and there was a permanent stage set up in the middle of the city for concerts, poetry readings and dances. Performances happened virtually every single Sunday, and they were always incredibly professional even though the performers ranged from local citizens to university students to professional performers. By the time I had been in Tajikistan for just a few months, I was convinced that every single person knew how to sing, dance or play a traditional instrument. There is also an extremely rich poetry tradition in Tajikistan, and children learn from a young age how to recite poetry in a very dramatic and uniquely Tajik way. Cultural festivals and celebrations are also central to Tajik society. I was lucky to be in Tajikistan during Nowruz, the spring festival which is celebrated all throughout the region. During a weeklong period, you can hear music, find traditional foods, and see bright and colorful clothing everywhere you go. I was also in Tajikistan for the month of Ramadan, and it was fascinating for me to talk to my friends and colleagues about the holy month. What’s next for you? Would you consider going back to Tajikistan? I would love to go back to Tajikistan, and I certainly hope to do so as soon as I can! I had an amazingly positive experience in Tajikistan, and I grew tremendously as a person and educator. Next on my list, however, is a new nonprofit educational organization that I am developing. The mission of the nonprofit International Women’s Education Initiative (IWEI) is to reach out to women in the Central Asian region who have traditionally had limited access to high-quality educational programming. I was able to identify a small group in Tajikistan and a group in Uzbekistan that I have had initial discussions with, and I will launch a pilot project in 2019 with both organizations. A sub-category of IWEI is the International Women’s Writing Project, and I will be working with a group of women in the Fergana Valley in Uzbekistan starting in the spring of 2019 on a creative writing empowerment project. I am still in the development phase of that project, but I am incredibly excited and can’t wait to launch the project and my new organization. I have also recently been added to the Fulbright specialist roster, and I am open to exploring new regions of the world if there is an interesting project where I can make a difference.